Although it’s quite a controversial topic, then benchmark performance of new devices always attracts a lot of interest. 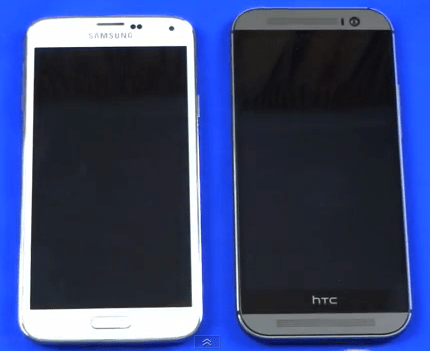 At the moment, the two top Android phones are the HTC One (M8) and the Samsung Galaxy S5. In theory, the Galaxy S5 should be ahead of the M8, in terms of performance at least. The S5 has a 2.5GHz quad-core CPU whereas the M8 has a 2.3GHz quad-core CPU. Both run the Qualcomm 801 chipset and have 2GB RAM but the extra clock speed that the S5 has should definitely give it the edge. There have been lots of Tweets and blog posts elsewhere questioning the performance of the Galaxy S5 and comments like “What’s up with the Galaxy S5 performance ?” seem not to be uncommon. In the video below you can see me running a benchmark test on the Galaxy S5, side-by-side with the HTC One (M8). The results may surprise you…!